Nimbus Trio are composer/pianist Kitty Xiao, flautist Jessica Laird and violinist Chloe Sanger. Lovers of new music, the ensemble commission and perform music of living composers with a focus on Kitty’s original works. Nimbus Trio have released their first album Novum as a represented artist of Move Records label. Nimbus was the winning work of Music Society of Victoria’s 2013 David Henkels Composition Award. The Novum trilogy were listed as finalists in the 2016 Areon International Composition Competition. Nimbus Trio have been broadcasted throughout Australia including ABC Classic FM, 3MBS, 4MBS and PBS. The group have performed at various venues and festivals including Deakin Edge at Federation Square, Elder Hall at University of Adelaide, Meat Market, Adelaide Fringe, Mapping Melbourne Festival and Melbourne Recital Centre. Guest musicians include Miles Brown, Tom D'ath, Cameron Jamieson, Luke Carbon. See and hear where Nimbus Trio are performing next. Jessica Laird is an Alto Flute specialist with a passion for new music. She credits this pursuit to being exposed to a broad range of musical experiences. These include many years in music theatre and experience performing in contemporary styles including jazz, gospel, big band fusion, funk, hip-hop and electronic music. Her interest in new expression through sound exploration and improvisation is reflected in The Laird Project, a collaborative duo formed with her husband, contemporary saxophonist, Rohan Laird. 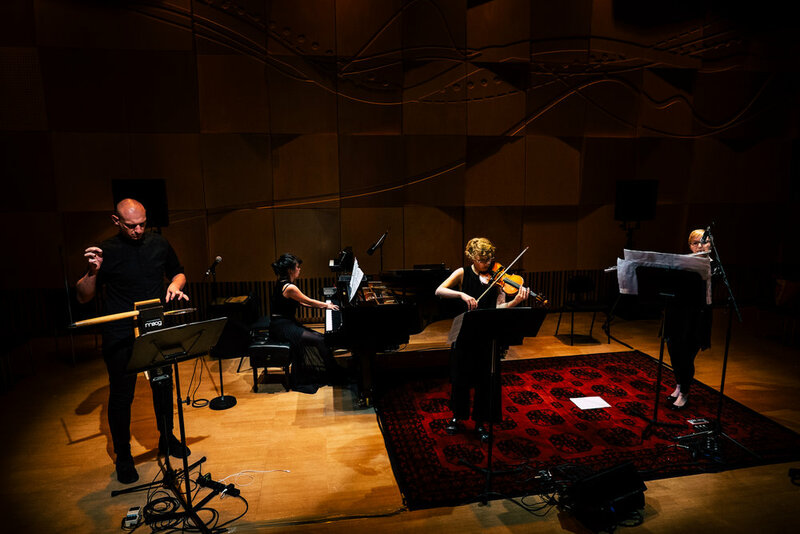 She is a founding member of Nimbus Trio and has had the opportunity to premiere new works live on radio, in recording and in performance throughout Melbourne and interstate. Jessica trained at the Melbourne Conservatorium of Music under the direction of Peter Sheridan and Mardi McSullea, becoming the first to complete specialised Bachelor and Master studies on Alto Flute as a principle instrument. Jessica is a represented artist with Move Records and holds positions as woodwind teacher and ensemble director at a number of prestigious private schools in Melbourne. Chloe Sanger is a violinist, writer, and educator, passionate about new and experimental music. She is a founding member of six-four, a chamber music collective that seeks to bridge the gap between contemporary art music and modern audiences. Chloe’s other projects include experimental art-pop band Diana’s Foresters and post-punk band The Dull Joys. She has been a violinist with the University of Melbourne Symphony Orchestra, AISOI, and Melbourne Opera, performed in the Melbourne and Adelaide Fringe Festivals, and has been a session violinist for multiple recording artists. Passionate about education, she is a tutor at Border Music Camp, run by SSO Librarian Alistair McKean, and currently teaches violin, voice, guitar, piano and songwriting. Aside from her performing projects, Chloe is a writer for CutCommon Magazine, where she discusses innovation in Australian art music. Miles Brown is an Australian thereminist, composer and experimental artist. Working with the ethereal interface of this gesturally-controlled instrument, he conjures unique emotional landscapes that query the relationships between space, sound, electronics and the body. Through composition, performance and cross-disciplinary collaboration, he develops new contexts for theremin that both expand upon and subvert its traditional uses. Miles’ work is a constant celebration of originality, strangeness, and the beauty of unorthodox creative combinations. Current works investigate the theremin in the realms of dance music, art sound, soundtrack, site-specific installation and analogue electronics. Miles has created commissioned works for the City of Melbourne, Dark MOFO, Dancehouse Melbourne and has released albums on international labels Death Waltz Originals, Mondo, Twisted Nerve, Denovali, Seed, Trendkill, Exo, It Records, OSCL, and Homeless. Miles has toured internationally collaborating with notable artists including Lou Reed, Laurie Anderson, Marc Ribot, Goblin, Black Mountain, Bardo Pond, Alexander Hacke (Einstürzende Neubauten) & Danielle de Picciotto, Lydia Kavina, Carolina Eyck, Unconscious Collective, House of Vnholy, Natalie Abbott, The Night Terrors, Sinoia Caves, Melt-Banana, Mick Harvey, Oren Ambarchi, Heirs, J. P. Shilo, Karina Utomo and Ash Wednesday. He has performed at the Melbourne Festival, Adelaide Festival, VIVID Live, St. Jerome's Laneway Festival, Big Day Out, Falls Festival, Paradise Music Festival, Melbourne Music Week, Homebake, High Vibes, Festival of the Sun, St. Kilda Festival, Queenscliff Music Festival, Polyhymnia (DE), Incubate (NL), Bracara Extreme Fest (PT) and Denovali Swingfest (DE). In his final year of his Undergraduate degree at the Faculty of Fine Arts and Music - Melbourne Conservatorium of Music, Tom D’Ath is a Melbourne-based clarinetist who finds himself comfortable in any musical situation. His upbringing through the music program at Eltham High School exposed him to a wide range of musical styles and ensembles including jazz, classical chamber music, wind band, and solo performance. This year Tom finds himself performing with the MCM Wind Symphony, University of Melbourne Symphony Orchestra along with chamber groups such as the New Music sextet six-four, clarinet-cello-piano trio Ensemble Contineo, and of course, Nimbus Trio. When he isn’t in a practice room, Tom likes to eat, sleep, play with his cats, and listen to Brad Mehldau. After completing his Bachelor of Music - Advanced Performance Violin - at the Queensland Conservatorium, Cameron Jamieson moved to Melbourne to further his studies at the National Academy of Music. Now a freelance artist, Cameron's diverse performance career has seen him performing with the Melbourne Symphony Orchestra and Queensland Symphony Orchestra, Southern Cross Soloists, Philharmonia Australia, Camerata of St John's, Arcko Ensemble, Momentum Ensemble, as a chamber musician with the prize winning Carl Vine String Quartet, Bluestone Quartet, Alchemy Quartet, Bridges Collective and Nimbus Trio, as a soloist for Opera Scholars Australia, Essendon Symphony Orchestra and Queensland Conservatorium Chamber Orchestra, as well as serving as concertmaster for CitiOpera, Royal Melbourne Philharmonic, ANAM Chamber Orchestra and Queensland Conservatorium Chamber and Symphony Orchestras. Cameron's playing is heard on prime time television, popular artist albums and feature films. Cameron is also an active composer and electronic producer and he is currently coordinating a national network of artistic services, Aura Services and is engaged with all of it's subsidiaries. Luke Carbon is a Melbourne-based clarinet, saxophone, and woodwinds player with a passion for new music and new venues. He studied with Paul Dean and David Thomas at the Australian National Academy of Music during 2015-2016 and was awarded a Master of Music Research (Griffith University), the Musica Viva Chamber Music Prize for a performance of the Sextet by Penderecki, and the ADFAS Melbourne Prize for Outstanding Program for his exploration of third stream music, including the Australian premiers of works by Gunther Schuller and William Russo.